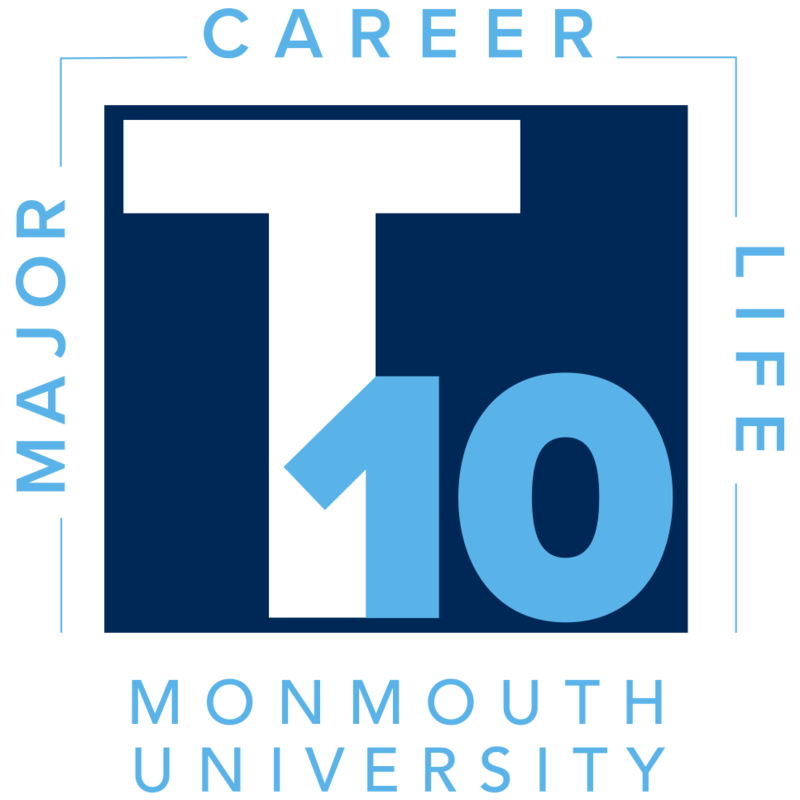 The Transformative Ten (T10) is a series of ten events designed to help students connect the major to prospective career options in preparation for life after Monmouth. This initiative is a direct response to student perceptions and concerns with exploring majors and career opportunities. It brings together current and new programming for a complete portfolio of activities. Please look for this logo on flyers and announcements via the MU portal and social media as the events are offered. What is the T10 and how does it work? T10 events are available to all students. Students who attend and sign in at T10 events during the academic year are invited to a capstone dinner, hosted in the spring, with a keynote speaker on employment/industry trends and networking opportunities. Faculty are also invited and sponsor a student. If interested, please contact Anthony Urmey, Director of Transfer Student Services and Undeclared Services (aurmey@monmouth.edu). What about other existing events? Department and/or school-sponsored events are extremely valuable for our students and we invite you to join the Transformative 10 lineup for cross promotion and student participation. Please contact Jeff Mass, Assistant Director of Career Services (jmass@monmouth.edu) to connect. This is a discussion of the value of higher education, pursuing academic interests, and the range of career options for all majors. The Global Education Office Study Abroad Fair. Students are invited to learn about MU’s Global Education opportunities directly from faculty, staff, study abroad student alumni, and representatives from our partners abroad. Topics of discussion will include International Education, Internships, and Service opportunities. Join a variety of employers to network and secure an internship. This is a wildly successful event for students with many promising placements. Students meet more than 100 employers from a variety of fields to secure interviews, internships and full time employment. Join faculty from various disciplines to explore career connections, field qualifications, and the advantages of planning ahead with internships/volunteering/service to break into a field of interest and a long term career. This event brings local school districts and educational institutions to campus to meet with students and alumni to discuss career opportunities. Career Day Huddle – Thursday, March 28, 7:30 – 8:30 p.m.
Sharpen your career development skills in preparation for Spring Career Day 2019. Join an evening of interactive workshops that help students of all ages build confidence and connect with future employers. Enjoy free pizza and swag! The Power of the Pitch | First-Year students | Mullaney Hall Lounge: Learn the basics of networking and professional communication by practicing elevator pitch essentials. Get tips and strategies for making a powerful first impression. Backpack to Briefcase | Sophomore students | Oakwood Lounge: Get your resume on point and stand out from the crowd. Get tips and strategies to translate your talents into hiring potential for an employer or internship. Social Media and Personal Branding | Junior and Senior students | Wilson 104: Potential employers will google you! Refine your social media presence and develop a personal brand that will wow them. All attendees will get a chance to have their social content featured on MU’s official social media account. Join more than 100 local, regional, and national employers to discuss career opportunities and potentially secure an internship, full-time or part-time position. Meet employers representing private, government and nonprofit sectors. Career Services staff and student leaders will be on deck to help you break the ice and get oriented in the career development process. The program is open to Monmouth students and alumni. This Student Scholarship Week panel discussion features student participants in the 7th annual first Generation College Student Summit in March at The College of Holy Cross. Students will share their experiences, insights and leadership lessons learned by attending this student run conference. Students will also discuss programs and initiative that may be of value in support of first generation students at Monmouth. Students, faculty, administrators and employers come together to network and celebrate the conclusion of a successful year of Transformative Ten events at this prestigious invitation-only event with a celebratory dinner. The featured keynote speaker will be Mr. Jesper Helt, Chief Human Resource Officer, Commvault. Mr. Helt is an accomplished HR executive with broad background across various HR disciplines and extensive international and commercial experience. Mr. Helt will discuss topics such as Commvault’s values, company culture, employer brand, work / life balance and how they continue retain top talent. Mr. Helt will then conclude with some helpful tips and tricks to landing that first job out of college and open it up for Q&A.